Popayan Colombia was just supposed to be a stopover, a way to break up the long journey from Cali to Pasto. It wasn’t a place I expected to love as much as I did. 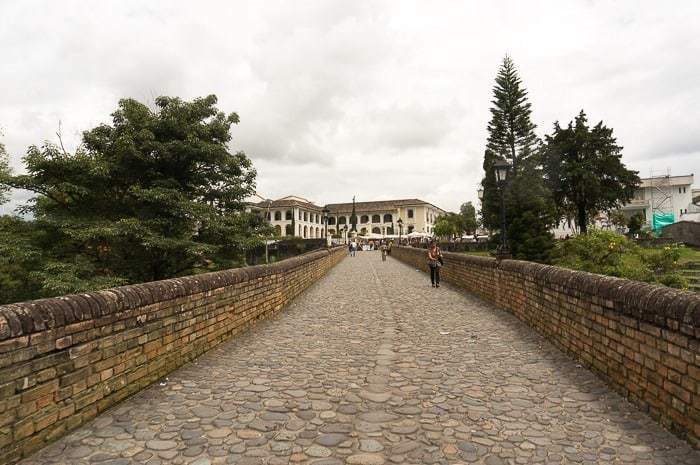 Indeed, Popayan was one of the most unexpected of surprises on my travels throughout Colombia. 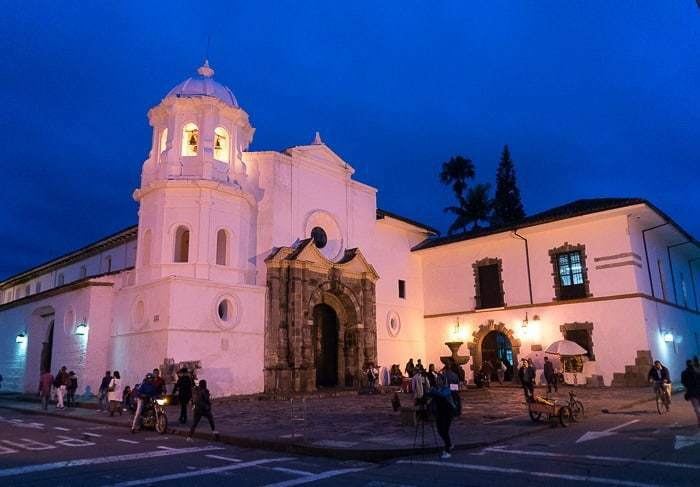 While it may not be on the radar of most people traveling or backpacking through Colombia, there are plenty of things to do in Popayan Colombia. Popayan sits about halfway between Cali and Pasto, about three hours from Cali and five from Pasto, and it is known quite appropriately as the White City. Yes, it’s another old colonial town, with parts dating back centuries, but the architecture is beautiful, ornate, and the white wash coat just gives it a certain touch that I haven’t seen elsewhere. 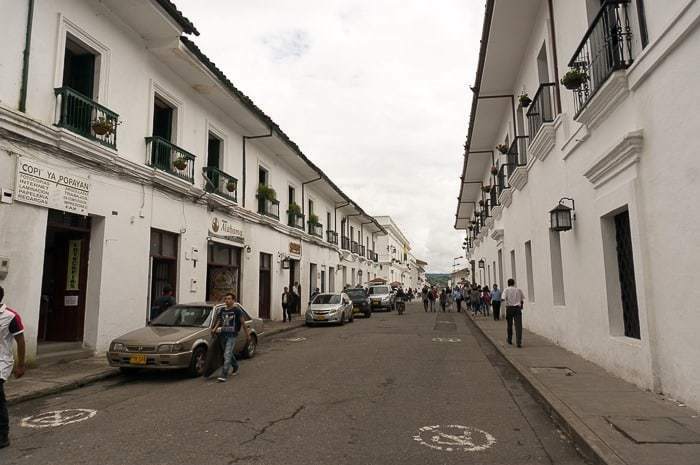 Popayan Colombia is now among my favorite old colonial towns, not only in Colombia but throughout Latin America. 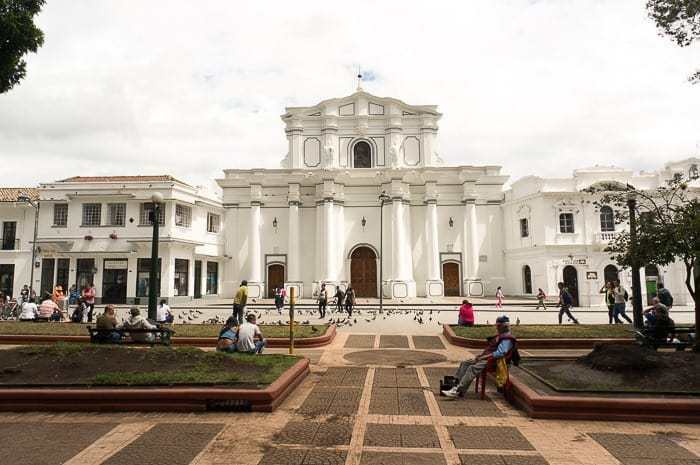 But the best part of Popayan is that it’s not just a tiny colonial town, but there is a medium sized city surrounding it with plenty of modern comforts from movie theaters to massive supermarkets. In a way the city reminded me of what I loved about Merida, Mexico. 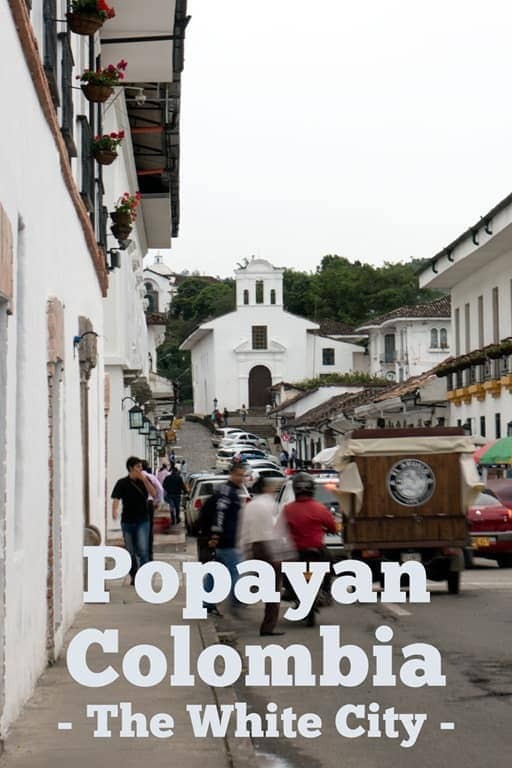 So what about those things to do in Popayan? Here are a few ideas to keep you busy for at least a few days. This 19th-century bridge was constructed to improve access to downtown for the poorer communities outside. Even today it provides a nice pedestrian only access to town. 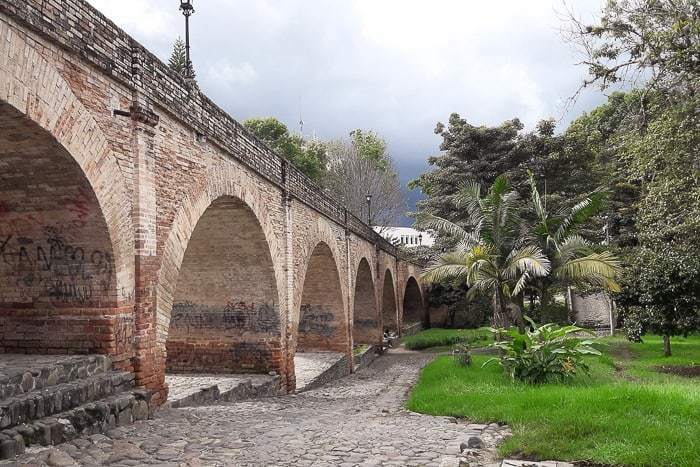 Eleven arches span nearly 800 feet as you walk across its cobblestones and look down upon a small stream running through a thick green park where couples embrace. 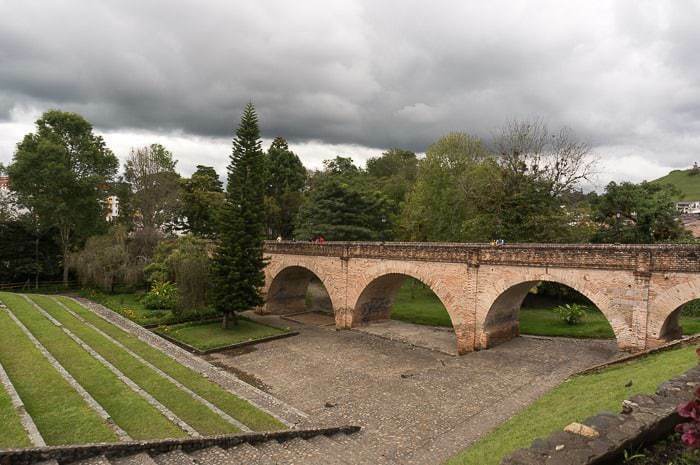 The historic downtown surrounding Parque Caldas is fascinating to walk through. As mentioned before, the numerous churches and overall architecture is simple but ornate, even the street lamps strike me as beautiful as you walk around. It’s just fun to explore, each block holds a different surprise. You’ll know if you leave the downtown core because there will be a sudden transition to traditional buildings without the white, just turn back around and keep wandering. 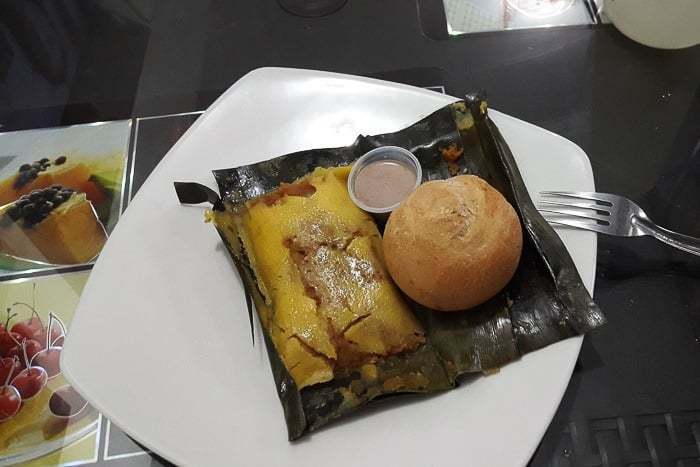 All over town you will see empanadas or tamales de pipian, a local take on these popular regional dishes. Pipian comes from a potato base, mixed with roasted and ground peanuts, garlic, tomatoes, onions, hard boiled egg, and more. Both tamales and empanadas are often served up with a spicy peanut sauce that you can drench over the top. I found both the peanut sauce and the pipian to be delicious. 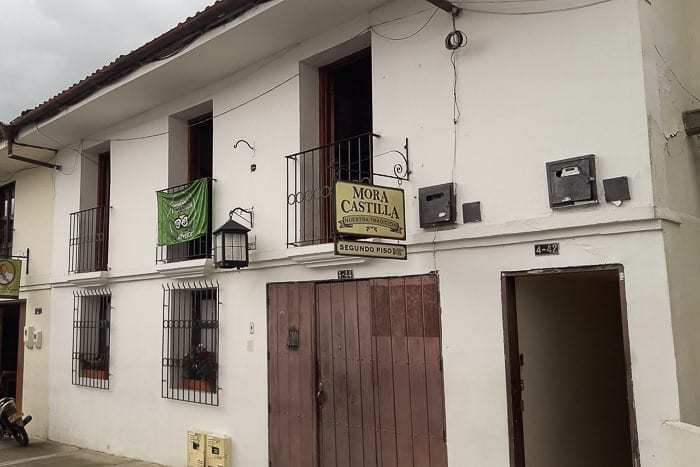 You will see signs for either all over town, but one of the best restaurants in town is Mora Castilla, just a few blocks from Parque Caldas. The place specializes in the popular local street food (think deep fried and relatively unhealthy) but is served up in a comfortable sit down restaurant. Most surprisingly, the prices are still street food prices — everything is dirt cheap. 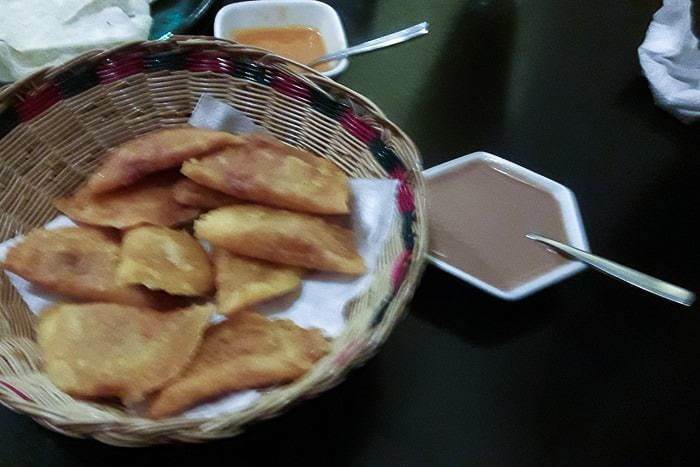 You can grab a 10 empanaditas (mini empanadas) for a little over a dollar, you can get the tamales here, you can find cataranta — a sort of giant potato cheap made out of corn which you can slather with an hogao salsa. Everything we tried was delicious and cheap. Beyond Mora Castilla, there is a modest bare green hill (also visible from Puente de Humilladero) where you can hike to the top for an expansive view of the city below as well as the surround countryside. The walk to the base of the hill is short and safe, and the hike up is popular among the many students that call this city home. 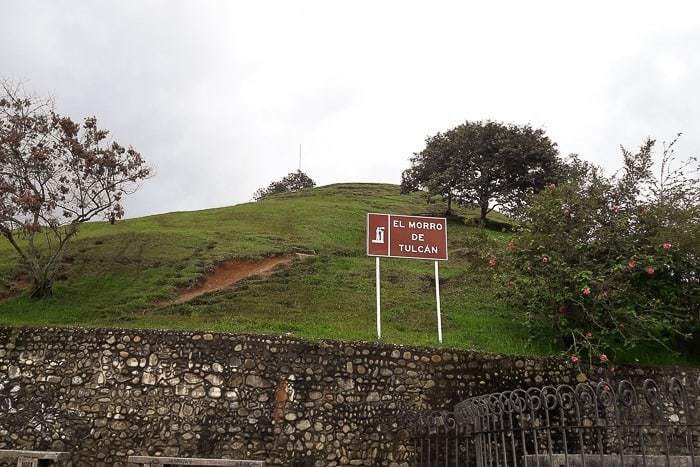 Some hike straight up the grassy hillside (causing erosion) but on the back you will find a cobblestone path leading to the top where a statue of the Conquistador Sebastián de Belalcázar and the view awaits. There is unfortunately a lot of graffiti at the top, and you may not want to hike up there at night. The site was an Indian pyramid which the Spanish conquerors found abandoned. I was surprised to see so many upscale coffee shops this far south and in a city of this size. In some ways it beats the big city of Medellin in terms of coffee quality. 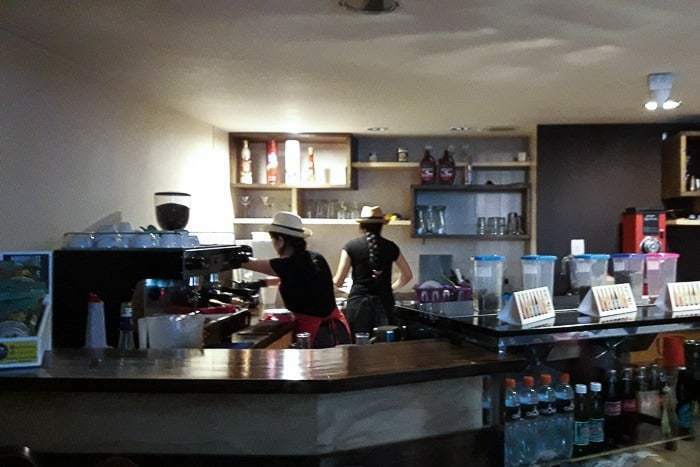 There are a number of good shops to choose from… If you prefer ambiance, I really liked Madeira Cafe, it you prefer great coffee, the nod has to go to Oromo. Oromo is an unassuming little place, with laid back, casual vibe. 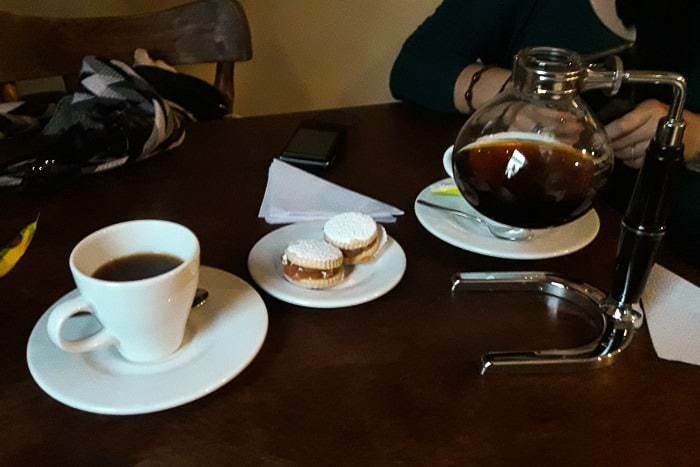 We were ignored for a while when we first got there, so the barista brought us some alfajor cookies on the house to apologize. We ordered up a serving of siphon coffee with beans from the Cauca department. Now it isn’t common to see siphon prepared coffee in Colombia, or in many places at all really, so we definitely opted for this method of preparation. 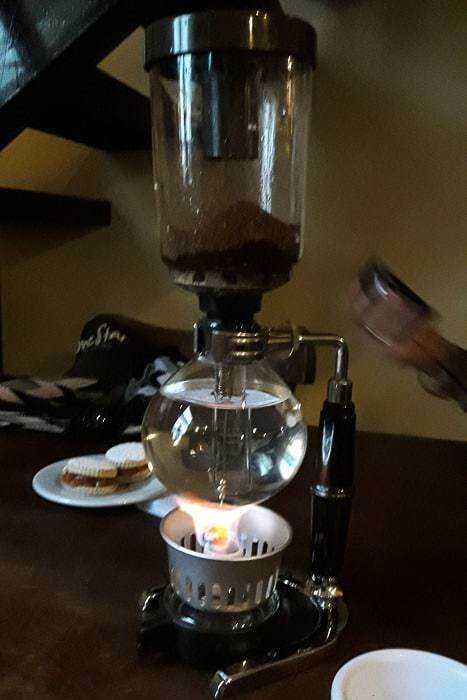 The barista brings over a cup of freshly ground beans and has you take in the aroma, then he returns with a chemistry like contraption straight out of Breaking Bad. Basically the beans are held in a chamber up top, and the water in a chamber below. They place an open flame under the glass beaker and the water boils and passes to the chamber with the ground coffee to steep. Once all the water passes above, they remove the flame, and the water drips back into the chamber below for serving. The whole time the barista was talking with us about the coffee and preparation, quite hands on, and quite special. It felt like a nice complimentary experience after our recent coffee farm tour in Salento. The brew was absolutely delicious, and a wholly unexpected surprise in a town full of great surprises. Best of all, it was only 8.000 pesos for the two cups (less than $3). 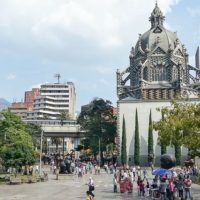 San Agustin – There are day trips on offer to visit San Agustin from Popayan, and while the ancient statues are awesome, I would not recommend doing it as a day trip. Go spend the night or a few in San Agustin, it’s an area worth exploring. Volcan Purace – This is one I really wanted to do, but we were there during rainy season. Volcan Purace stands at just over 15,000 feet and sits a few hours east of town. Day trips can be organized with an early morning departure for around 100.000 pesos, including a local guide at the base of the mountain. Some organize overnight trips at the cabana, or stay longer to enjoy the hot springs. Stay as close to the historic downtown area as you can. We found a budget choice just across the other side of the Puente de Humilladero, called Hotel Alcala Colonial. The place was decent enough with private bath for an incredibly cheap 35.000 pesos per night ($12) and with a great location, which had us walking across the bridge at least twice per day. The cheap price will let you splurge on lots of delicious coffee at Oromo. 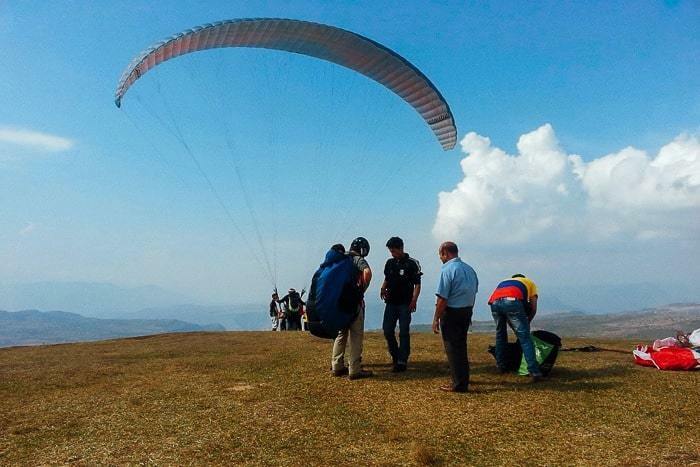 Did you enjoy this post about things to do in Popayan Colombia? Please take a moment to share it on Facebook, Pinterest, or Twitter. It is always nice to come across a well-informing travel blog while doing research for my own upcoming trip. In August my family and I plan to fly in to Cali, pick up a rental car and head over to Popayán as our inaugural stop in Colombia. From there we plan to go to Tierradentro, followed by San Augustín, before heading back to Cali. 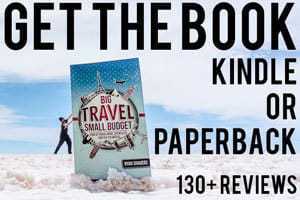 In the printed travel guide books I keep coming across comments about how bad the roads are and the going is slow. However I do find that bit of information vague. As you’ve just been there recently, what are your takes? Would renting a 4×4 vehicle be more practical than a regular sedan? Thanks. Thanks Iwen! I drove the passes between Armenia and Ibague and then down south between Mocoa and Pasto (Trampolin de la Muerte), so I haven’t driven the particular roads you are looking at, but from my understanding they are pretty similar… Windy, unpaved mountain roads. Trampolin de la Muerte is supposed to be in the roughest shape of all of them, and it wasn’t really too bad to be honest. Going is slow, sure, especially with the big trucks that climb the high mountain passes super slow and very few places to safely pass. But the roads aren’t in particularly bad shape at all. My truck is 4×4 but I never used it even once on those roads, and there are plenty of Colombians who make the drive in normal 2WD sedans. I think you’d be fine with a regular rental car, but the only variable might be if you get some really heavy and unexpected rains (it should be the dry season when you’re there, but sometimes things are out of whack with climate change and/or El Nino), which is also when those roads are susceptible to land slides which can cause big delays. You can check out iOverlander.com where sometimes people post updated road conditions or warnings, which may be of help. 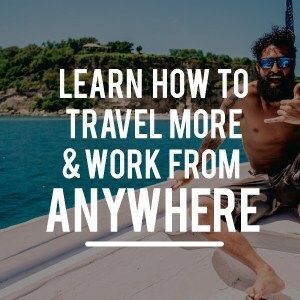 I really enjoyed this post, you are doing exactly what I am planning to do myself, with the exception of being able to create such an incredible blog. 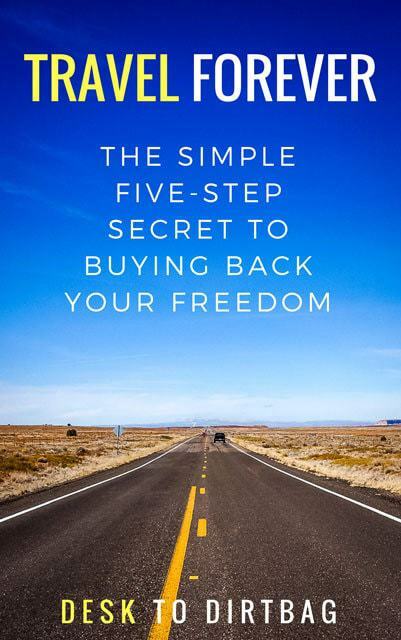 I own a home and have devised a plan to allow me to travel for as long as I desire. We’ve decided to rent the home out to a tenant so that we’ll be able to pay the mortgage without too much trouble. We are not going to leave our belongings in the home because they are dear to us and want to maintain their condition. We decided to purchase a portable storage building and have it delivered and set up on our property where we will move all of our belongings into, seal it and lock it until we return. This will save us lots of money on a rented storage facility as well as allow us to keep out things on the property. We are near Oklahoma City and found a local company who prefabricates these buildings and delivers right to your home. Ready to use that very day! I’ve shared their link in the website section. We feel like we can be gone for years if we decide to. Initially we thought about traveling to Europe but with the terrorist issues we’ve decided that South America is a better choice. 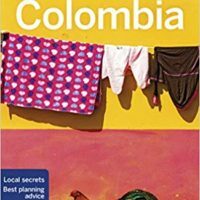 Columbia, Ecuador, Peru and Argentina are high on our list and after reading your article, our thoughts have been confirmed. 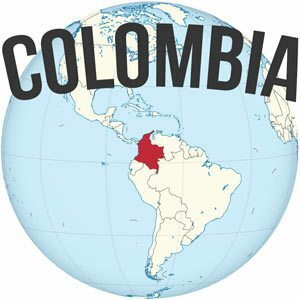 Beginning in January of 2018 we will be leaving the US for Columbia! Thanks for such great info and pictures! Hey David! That’s an awesome plan you’ve got there, I hope it works out as planned and allows you to travel indefinitely. Love the on-site storage idea, that’s great. 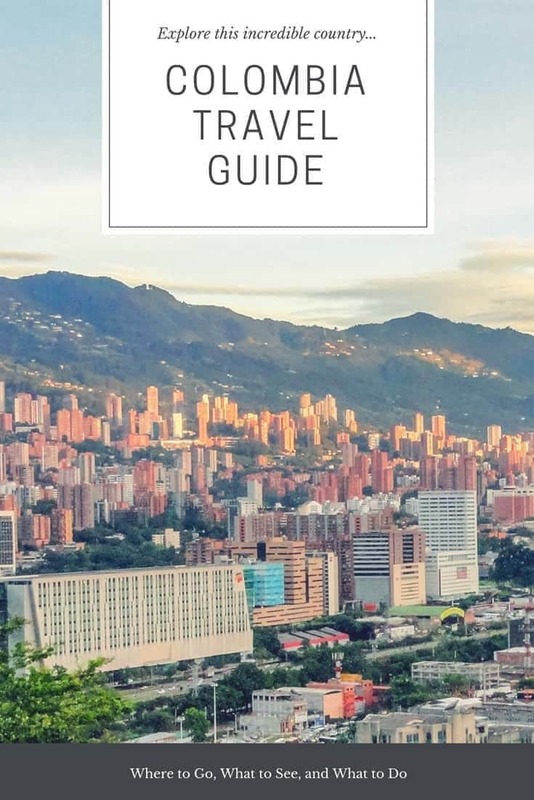 I haven’t made it to Argentina yet, but I’ve been blown away by Colombia, Ecuador, and Peru — they are all great countries with so much to offer. 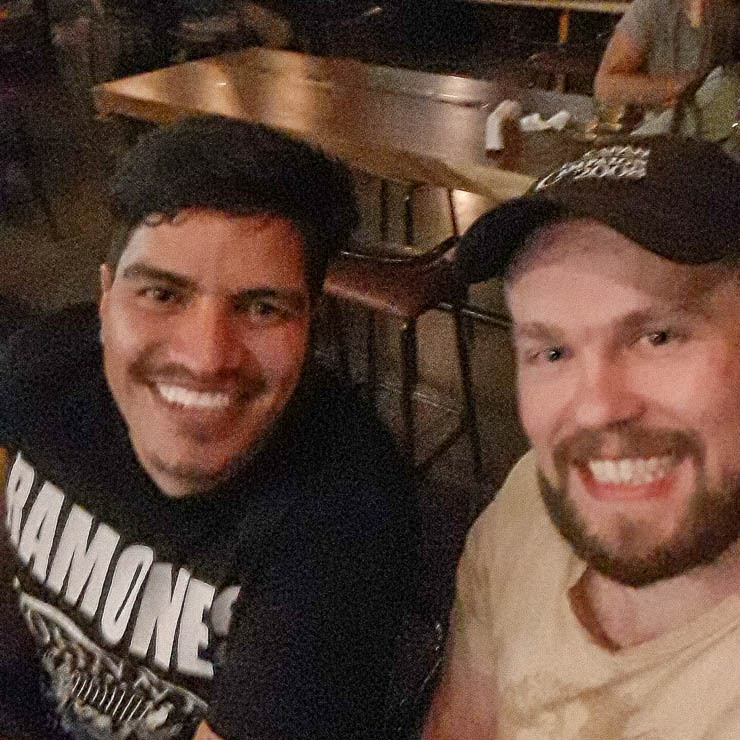 Things aren’t perfect here in South America, of course. You should always be aware of your surroundings and your belongings, but there are no worries of terrorism or radicals here, at least. Safe travels!